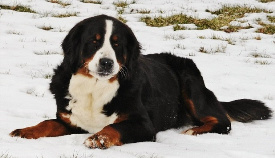 Juno, one of my mother’s dogs, may just be the sweetest Bernese on the planet. She radiates love for every person and animal she meets. Some of my staff adore Juno so much that they’ve already asked to adopt her when she retires. A tall, dog with a stocky build, Juno is also docile and calm. She is happiest being with people. If she had it her way, she’d spend the day cuddled up with me. She has the classic Berner lean and gets as close to people as she possibly can. Juno seems to have a special connection with me. I feel like she can sense exactly what I’m saying to her, and if I ask her something once, she does it. She doesn’t have the stubborn streak some Berners display. Although she is very loyal and loving—a big, teddy bear—I honestly think she could go home with anyone and be happy. She warms up to everyone quickly. I would say Juno is the most laid back Berner I own. She gets this trait from her mother, Whitney, who is nearly 10 years old and still acts like a pup at my mom’s kennel. Whitney is my mom’s gentle giant. She is so obedient, and walks perfectly on a leash. I’ve never heard her bark in my life. Juno’s father is my beloved Daiko. I imported him, along with his sister, Dyne, from Belgium after doing considerable research. I have great respect for their breeder and have always been happy with the quality of their dogs. Daiko’s ancestors were checked for hip and elbow many generations back, and all rated the equivalent of excellent or good in OFA terms. Further, all ancestors’ elbows have been rated as normal. Daiko became a Canadian champion before his first birthday—over the course of three weekends. The first weekend, he won best of breed. The second, he also won best of breed. The third, he won best of breed, best puppy in group and came fourth in the adult working group (when he was only a puppy!). He had an incredibly temperament, and was very intelligent. He excelled in his obedience class, and I only had to show him something once and he knew what to do. He was just a big, loveable bear who always tried to please us. Sadly, Daiko passed away at the age of nine recently. Although I have many dogs and love them all, he was very special. Many of my dogs retire into someone else’s home, but Daiko stayed with us till the end, and I’m still grieving his loss. He lives on in the legacy of his wonderful offspring, and Juno is a prime example. 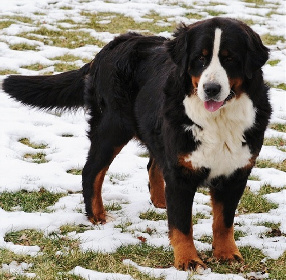 Both of Juno’s parents can be seen here: bernesemountaindogpuppies.ca or moorsbernese.com.